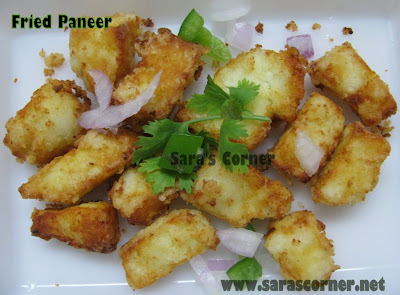 Crispy Paneer | Women's Day Event Announcement and a Giveaway! This has been in my drafts since long long time and thought of posting it now. I prepared this to my MIL who eats non spicy food and for my son. Happy Holi to all my celebrating the colourful festival! Kesari/orange colour a pinch - Optional I have not used. Thaw the paneer and put in hot water for few mins. Remove water and keep paneer. In a bowl make watery batter with Arasi, Chola and Kadalai maav and whisk well without forming a lumps. Add chilli powder and salt. Add the paneer, coat it drop in oil and deep fry till brown. Serve Crispy Paneer with Tomato Sauce. Notes - You can deep fry directly also. Tomorrow 8th March is International Women's Day, its time to think of all women in your life and say thank you. Post any vegetarian recipe dedicated to women in your life and link it here. This event is from 7th March to 31st March 2012. Multiple entries allowed. Only fresh entries and no archived posts please. Add of logo and this event annoucement is mandatory. Hope you see your entries. Electrolux a great resource for home applicances and product accessories. They have a wide range of kitchen, laundry support and many more. Please visit their website here to view the products. The giveaway is a $35 gift coupon and you can shop online for Electrolux Accessories Product. No geographic restrictions. This giveaway is open worldwide. Thank you Electrolux for the giveaway. 1. Follow my blog via google connect. 2. Join Sara's Corner on Facebook. 3. Subscribe in reader or email. Those who are already following just leave me a comment and linking your entry for the event. Others also leave me a comment after doing any of the above by linking your entry. Winner will be chosen on 2nd April. Happy Women's Day and I am happy to be a women. Can u bleed for a week & survive??? Can u squeeze a 14 inch baby from a 10 cm hole??? Can u carry a 7 pound baby in ur stomach for 9 months?? Can u tk care of d child, cook, clean & talk on d phone @ one tym??? Can u carry a 108 lb shopping bag??? Can u go a week eating only salads??? Can u watch d love of ur lyf b wid someone else??? Can u burn ur forehead wid a curling iron n not complain??? Can u walk all day in a 5 inch heels??? Can u cry all night & wake up next morning like everythings ok??? I REALLY DONT THINK SO!!!!!!!! HAPPY WOMEN'S DAY my dear friends. Anything with paneer I am for it:-) Lovely! superb quote, great to be a women. happy women's day to all women in this world. Happy Women's Day, and a very yummy snack dear great with some green chutney..
That's a nice forward! Loved reading it! Will definitely send in some nice recipes for the event! There are so many special women in my life! Absolutely love this quick preparation of snack paneer. Happy hosting. I have just added my link Pazham Nurruku to your event. I follow you on Facebook, Google Connect and also thro' email. surely kids will like it! !gud one! Lovely event..will try to send my entries soon...just moved to Brazil and still settling down. Hi Sara, linked in two, but I don't know how to display the logo, it doesn't allow me to copy.. Delicious n Great Event n Happy hosting Dear. Thanks sara. I will update it..Love what you have written about..I wud like to add one more if you dont mind..we are the ones who do all the shopping,cooking, taking care of kids, running a family yet facing criticisms for every action we do but still nothing will run without us! I will send a recipe for this giveaway too, happy hosting! Sara...m not able to get the logo...wondering! !like Hema said it refuse to b copied!! Sara, Im not able to download the logo- I have posted the recipe today. How to ppost for the event? First, time here and like your space with so many recipe collection. Happy hosting and I'll send my entry for the event. Here is my posting. This is dedicated to my mom and grand ma who taught me cooking when I was young. I have linked my recipe to the women's day event. Simple yet delicious preparation, Saraswati :) Love paneer in all its forms!